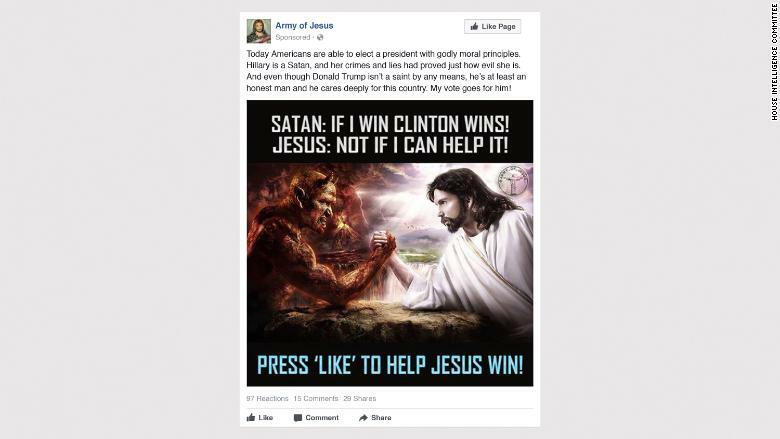 The House Intelligence Committee released on Wednesday a small sample of the ads a Russian troll farm purchased on Facebook during and after the U.S. presidential election. The ads released focused on divisive issues like immigration, religion and race, and some alluded specifically to Donald Trump, Hillary Clinton and Bernie Sanders. Facebook has said that it has found more than 3,000 ads linked to the Internet Research Agency, a St. Petersburg troll farm with ties to the Russian government, and that the ads were seen by more than 11 million people between 2015 and 2017. 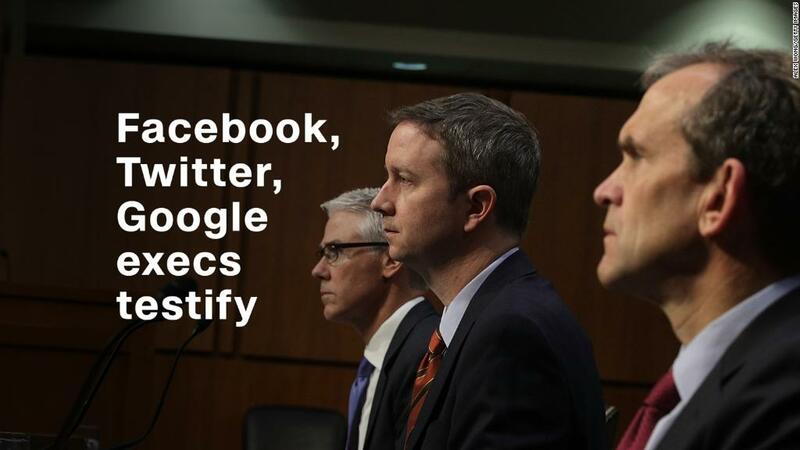 The House Intelligence Committee had been expected to release all of the ads, which Facebook has turned over to Congress and to Special Counsel Robert Mueller's office, but ultimately put out only about two dozen on Wednesday. The committee's Democrats, who were responsible for the release, called the selection of ads that they made public a "representative sampling." Rep. Adam Schiff, the top Democrat on the committee, said at the hearing that the committee still expects to release all of the ads eventually. Also included in the release was a document containing all of the Twitter account handles that Twitter has identified as being tied to the Internet Research Agency. The Internet Research Agency posted thousands of other pieces of content that were not turned into ads. Facebook has said that the Internet Research Agency's content was served to as many as 150 million people on its platforms, including both Facebook and Instagram. It is not clear how many of those 150 million people actually saw the content, however. Many of the ads released Wednesday came from Facebook pages whose Russian ties were previously reported by CNN, including "Blacktivist," a page designed to look like it was run by black American activists, and "Heart of Texas," a page supporting the secession of Texas. Below, a look at some of the ads released Wednesday, and some of the key information about each ad, including how much they cost and how many people may have seen them. 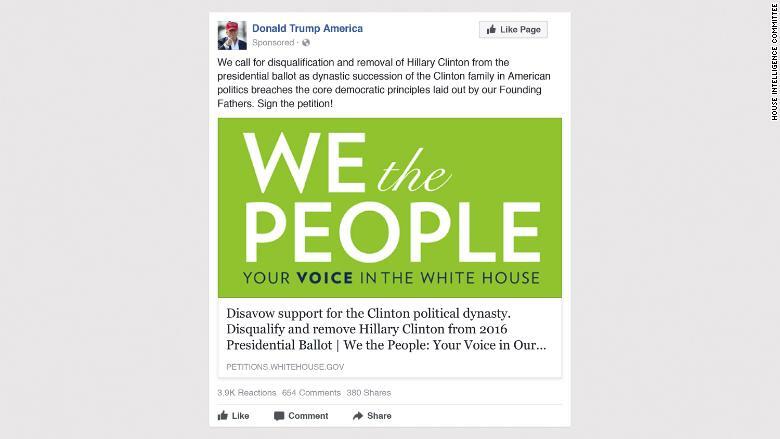 A Russian-run page entitled "Donald Trump America" called for "disqualification and removal of Hillary Clinton from the presidential ballot" and ran an ad linking to the White House's crowdsourced petition site, on which there was a petition that claimed the "dynastic succession of the Clinton family in American politics breaches the core democratic principles laid out by our Founding Fathers." The ad was targeted at people who had expressed interest in Donald Trump or his son Donald Trump Jr. on Facebook and ran for three days at the start of August 2016. It was shown in Facebook users' feeds almost 35,000 times and was clicked on 6,000 times. The ad was paid for in Russian rubles, and cost about $240 based on the current exchange rate. "Join us because we care"
The Internet Research Agency ran several pages designed to look like they were part of the Black Lives Matter movement. 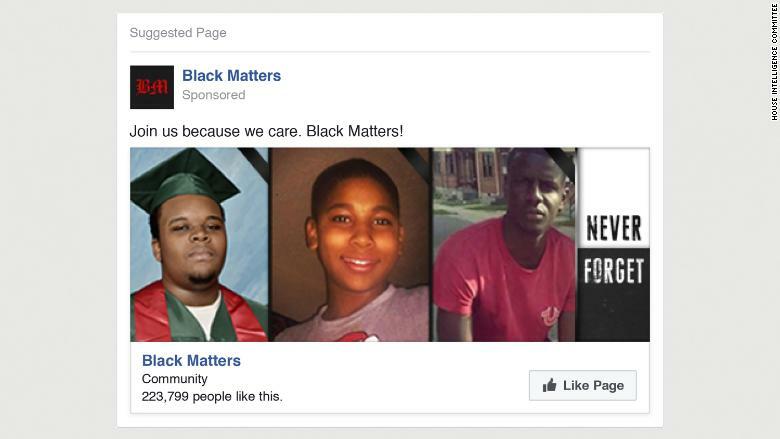 One ad encouraging Facebook users to like one of those pages, "Black Matters." The ad featured pictures of African-American people shot by police, and contained the message, "Join us because we care." According to data released by the House Intelligence Committee, the troll group spent more than $2,500 in 2015 and 2016, paid in rubles, promoting this ad. It was targeted to places around the U.S., including Ferguson, Missouri, the place where one of the people featured in the ad, Michael Brown, lived and died. 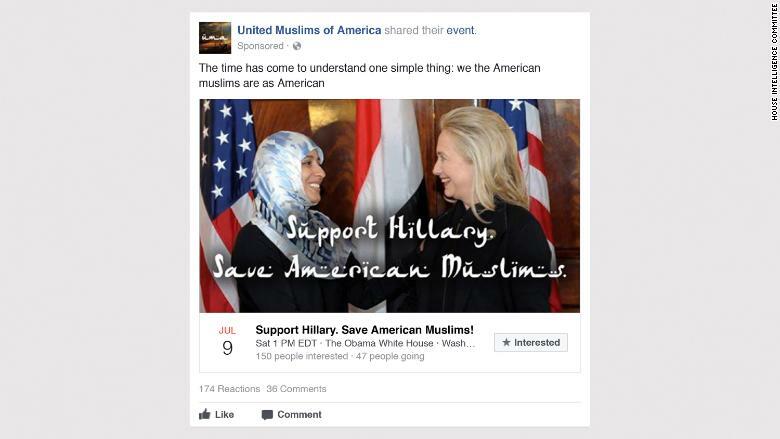 One ad promoted a "Support Hillary - Save American Muslims" event that was set for outside the White House on July 9, 2016. That ad was targeted at people who had expressed an interest in Hillary Clinton or the Muslim Brotherhood on Facebook and who lived in Washington, DC. 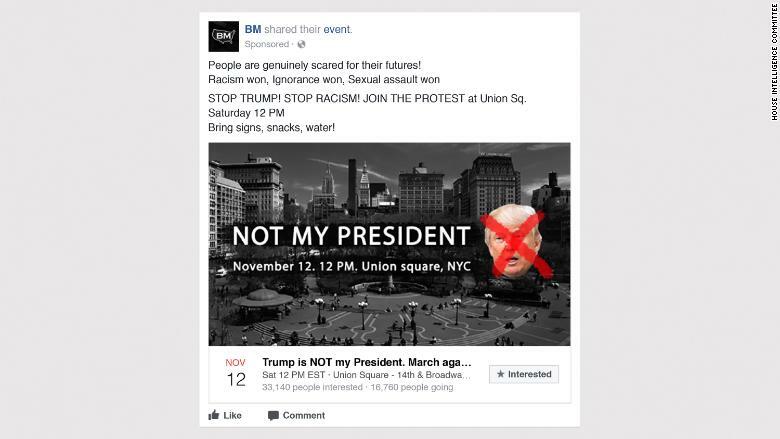 On the morning after Election Day 2016, the Russian page "Black Matters," which was designed to look like a black activist group, began promoting a "Trump is NOT my president" event, to take place at New York City's Union Square. The ad was targeted at people living in New York, according to the release from the House Intelligence Committee, which does not specify whether it means New York State or New York City. "Satan: If I win Clinton wins!" On October 19th, 2016, a meme appearing to show Satan and Jesus Christ arm wrestling was posted on the Russian page "Army of Jesus." The post accompanying the image read in part, "Hillary is a Satan.. And even though Donald Trump isn't a saint by any means, he's at least an honest man and he cares deeply for this country. My vote goes for him!" The ad was targeted at people in the U.S. who had expressed interest in conservative commentators including Laura Ingraham, Bill O'Reilly and Rush Limbaugh and also those who expressed an interest in Christianity, Jesus, and "Conservatism in the United States." According to the committee, the equivalent of only $1 was spent on the ad, generating 71 impressions and 14 interactions.